I saw Pirates of the Caribbean III last night. It still wasn't as good as the first one, but it was much better than the second one. It still needs major editing. After two hours, I was wishing it would end. One interesting aspect is that I think Keith Richards looks less creepy as a pirate than he does normally. Some of you will remember when I blogged about the bacon ice cream at Tayst, in Nashville. It was one of those "I am not making this up" blog posts. Thanks to the Amazon Daily blog, I discovered that Vosges is now making a bacon chocolate bar. Intriguing! I finally added a third column to the blog's layout template. It seems to look okay in both Firefox and IE, but it must not be quite right, because the Blogger tool for adding Page Elements doesn't seem to like it at all. You can still add elements and, but elements in the new right column produce these weird gray bars across the window, making it hard to see the elements in the left column. As long as it continues to work ok, I won't worry about it too much. It's fun working on this stuff, because I still haven't taken the time to figure out what I'm doing. I used a little bit of code from a Blogcrowds template, but quickly realized that it had all kinds of things that I didn't want. Fortunately, what little I selected and tinkered with seemed to mostly do the trick. I saw the movie, Easy Rider, last night. It's one that I've been meaning to see for a really long time. I'd always heard of it described as a movie about motorcycle riding with an awesome soundtrack and a sad ending. Surprisingly, I hadn't ever heard of it as a movie that reflects poorly on the South. It certainly does. My question is, have things really changed that much since 1969? Has intolerance for long-haired hippies just been replaced by fears of Middle Eastern looking men and illegal immigrants? Or has this xenophobia just spread to the rest of the country as well? 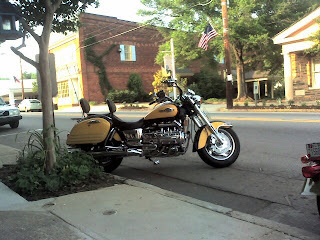 I also saw this beautiful bike in downtown Hillsborough last night. My Treo didn't really do it justice, but I accidently left my Canon at home. I would say that that the Durham FM Association hamfest was a success! We had two to three hundred attendees and I had a great time visiting with friends, one of whom I hadn't seen in a long time. I sold thirty brownies and coconut macaroons, at $1 each, all donated to the club. Best of all, I have 16 left. It was held at the Little River Community Complex, in Bahama. It seemed like a great site and the surrounding area was quite pretty. This is the club's infamous Mobile Communications Unit (also known as a bread truck with ham radios inside). Notice the nice trees and green stuff behind it. After working hard to get ready last night and all the festivities today, most of us are pretty tired now that it's over. This Saturday is the Nth Annual Durham FM Association Hamfest, which will be held in the vicinity of Bahama this year. It's a great opportunity to wander around, talk to friends , look at all the random electronic parts, feel nostalgic while looking at old computers and stock up on reasonably priced LED flashlights. You will also be able to buy coconut macaroons and brownies. Yes, I'll be spending my Friday evening baking again this year. If you are interested in going and you can't figure out how to get there based on the information in the link, let me know and I will be happy to confuse you further. I have been incredibly busy the last couple of days. GM went to a Math-Biology conference at Duke and stayed in the Purple Guest Room. We went out to dinner with friends numerous times, which required lots of spamming as the plans evolved. Tuesday night we played a crazy game that GM invented. Just to give you an idea, RN said that people who overheard us in the Barnes'N'Noble where we were playing probably thought we were from an insane asylum. In other earthshaking news, Nantucket Cafe & Grill no longer has chicken pot pie on the menu. This is a horrific tragedy and I need to write to them. I wasn't angered as greatly as I could have been because they had a soft shell crab special and they have decided to offer free giant pieces of cake (any non-cheesecake cake on their cake menu) with each entree, Monday through Thursday. Their sauteed soft shell crabs are excellent, too. Tonight I went to a small party at SY's new house and it was unbelievably pleasant having dinner on her porch while listening to all the birds sing and talking with my friends. The weather and the conversation couldn't have been better. The other night Venus and the moon were positioned such that they were right night to each other. It was worth going all the way to the end my driveway to get a clear view. I thought that all my photos were blurry, but they are actually quite nice, so I'm very pleased. It still doesn't compare to actually seeing it, though. A couple of days ago, I saw the movie Pan's Lambrynth. It's basically a Spanish film about how a girl who loves fairy tales experiences one for herself. I thought it was fascinating that this tale, which on the surface would be appropriate for children, was depicted with a great deal of fairly gruesome violence. It's done in such a way that makes one feel strongly against one of the characters, but I'm guessing that it wouldn't have taken much to make it suitable for a wider audience and retain much of that character development. On the other hand, I'm strongly against sanitizing everything for children. I think it's important for kids to be aware that, yes, there are people who torture others. They need to know that this is something that's condoned by many, including our government. Despicable people are unfortunately not rare. Parents who are expecting their children to learn such things on their own, when they are adults, are endangering the lives of their children. 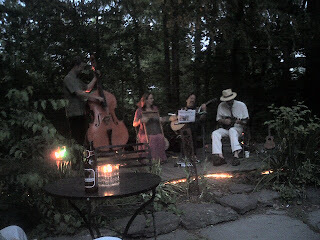 Last night we went to Caffe Driade, in Chapel Hill, to see Hugh and Anastasia (also known as HC and AM) play in their band, Skeedaddle. I'm using their actual names because they are now famous, having appeared on a small stage. They were probably famous in Charlottesville, too, but I didn't know them then. It was a lot of fun. They and their band members are so very talented and can play an impressive array of instruments. Caffe Driade has great coffee, too. We were worried that the concert would get rained out, but we managed to only hit rain on the way home. I am currently annoyed with myself for making a stupid mistake. Last Wednesday, I decided to try taking a picture of my soft shell crabs at ACME Food & Beverage Co. using the lowest resolution, to see if by any chance it took better pictures in low light. It didn't. I knew there wasn't much of a chance that it would make a difference, but I thought I would give it a try anyway. Unfortunately, I forgot to switch it back and I've taken many pictures since then. My only consolation is that these don't take long to upload, but it's still sad. This frog was peeking next to my front door the night I changed the setting. This cute little bird kept me company while I was eating lunch (the leftover soft shell crabs) last Thursday. I took some nice spring campus shots on the way back to the office after lunch that day. On Saturday, this squirrel was acting bizarrely by hanging off the side of the deck for minutes at a time while kind of vibrating. Sunday was graduation. I only attended the Computer Science Department's ceremony, as usual. 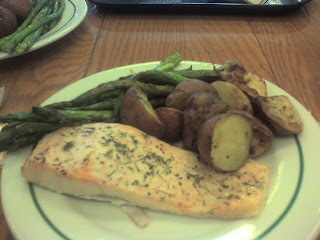 This is actually a shot from my Treo, because it was more interesting than what I took with my camera. Finally, is a photo of verbena bonariensis, which I took when I got home from work today. This is when I noticed that I could take over 1500 more pictures before running out of memory. Oops. I was practicing the guitar this evening and I often like to look for YouTube videos of songs that I'm learning. I started out looking for more Creedence Clearwater Revival and ended up finding a 1963 recording of Joan Baez playing Bob Dylan's Blowin' in the Wind, which I am also learning. Yesterday I asked for another blogger to make his blog's banner image be a link back to his blog, to make it easy to get back if viewing a single post. I just noticed that my blog doesn't work like that. Well, it does now, but it didn't a few minutes ago. It's very simple. I don't read my blog, so it doesn't have to meet my usability expectations. Ok, so that's not a very good excuse. Would I read my blog if I weren't the author? I'm sure I would if I knew me, but probably not if I didn't. 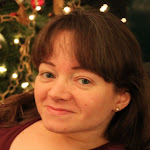 I rarely read the blogs of complete strangers on a regular basis, unless they have some connection to someone I know (particularly a family member) or have a local theme. If none of the above are true, they have to have lots of pictures of cats, dogs, have a large progressive following or write about gadgets. If I've heard them speak in person, then I don't consider them to be complete strangers, I usually sit on the front row, after all. So, if I spoke, heard myself, and were a good speaker, then I'm sure I would read my blog. Last night I saw Alice's Restaurant, by Arlo Guthrie. It had been highly recommended by LA and the song had been referenced many times by JJ, so I thought it was time to see it. I guess I would describe it as tangential, which coming from me, of course, is a compliment. It's definitely worth seeing. 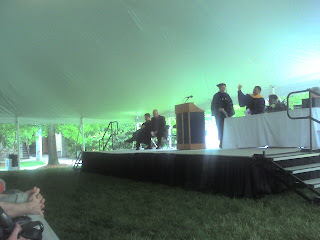 Normally on this day and at this time, I would be on Duke's East Campus for the graduation reception on the East Duke Lawn. We, however, are having a hail storm right now and I like only so much ice in my punch. I spent most of the weekend cleaning and preparing to have a bunch of friends over on Sunday night. I made two pizzas: one bacon, onion and tomato sauce and one shrimp, bacon and pesto. The dough rose beautifully, unlike my recent batches of roll dough. We also had a salad with spinach, lettuce, strawberries, walnuts, grapes and the Honey Asian Citrus dressing. I made brownies, too. It was great to do some cooking again, because it's something I really enjoy. As usual, my enjoyment of a particular activity is inversely proportional to the time I spend on it, perhaps with the exception of blogging. The important thing is that I had a really good time with my friends. We played Pictionary, which I probably hadn't played in 15 years or so. I think it was even more fun than I'd remembered. It was also great to have HS over, who turned out to be an excellent cooking companion. Monday night, my parents and I watched Paradise Now. That was a very interesting, but sad, film about two Palestinian suicide bombers. It seemed to fit well with what I could remember having learned in Dr. Miller's historical terrorism course at Duke. I had trouble with the subtitles, because the bottom half of the last line always got chopped off. There is probably some way to move them around or move the image on the screen, but I wasn't able to figure it out in the length of time that one can fool with such things before the rest of the audience starts to become restless. Tonight we celebrated Mother's Day. In the Triangle, Mother's Day always coincides with graduation at at least two of the local universities. At ACME Food & Beverage Co., they decided to make up for this by offering free dessert for mothers tonight instead. So, I took my parents out to eat, which was a nice mid-week treat. I don't have any pictures of the food, since it's too dark for my new phone, but take a look at this enormous portion of food that I got for lunch today at the Refectory. Friday night, after guitar practice, we went to Vin Rouge again, because 2/3 of us were craving steaks. In the past, that's been a bit of a pain, because most of their handicapped parking sign had disappeared and you had to use your imagination when looking for paint indicating where parking was prohibited next to the actual space. They've always had to look for someone in the restaurant or the one next door to ask the people parked there to move. Well, look at the glorious work that they've done! That blindingly white area is the new sign, which appears to also be quite reflective. JJ and EB were hiding on the other side of my van. My duck confit salad was exquisite. Yesterday, I went to the TRI-IT conference, hosted by UNC-Greensboro. For some reason, driving to Greensboro always seems like I'm traveling half-way across the world, despite the fact that it's approximately the same distance to Raleigh, which seems comparatively close. I think this is partially because you have to go through the splitting of I-40 and I-85 and I have this fear that I'm going to end up on the wrong one. It could also just be that I don't go there very often and it's not as familiar to me. TRI-IT is an organization of instructional technology staff members at universities in central North Carolina. We meet approximately once a semester and it was started at Duke several years ago. It's a nice community of people who are facing many of the same challenges. One of the highlights was a keynote on Second Life. In many ways, Second Life is cool. The graphics are nifty and you get to fly around. I, however, am still not very excited about the whole thing. I think the 3 dimensional models of buildings and trees are neat, but the whole avatar thing turns me off. I had a similar reaction to MUDs 15 years ago. It seems as if some of these virtual worlds add additional barriers to tasks that are more easily addressed by "standalone" applications. On the other hand, while I have seen an hour long demo now, I don't want to criticize it too much without having actually tried it myself.